A sparkling collection of literary essays, each one a bedtime rumination, Goodnight and God Bless is about books, writers, book events, mice, mothers, airport hotels, the wind and other such unexpectedly thought-provoking subjects, snugly interwoven with a warmly personal and anecdotal history of the author and her assorted family members. Spanning a literary career of a decade, this wise and witty book offers an ironic take on nearly everything, drawing from the experiences of the author as a woman, mother, daughter, wife and writer. Peppered with deliciously amusing quotes, footnotes and other erudite diversions, mostly unnecessary and unabashedly trivia, this is the perfect book to keep by your bedside, to dip and delve into anytime. 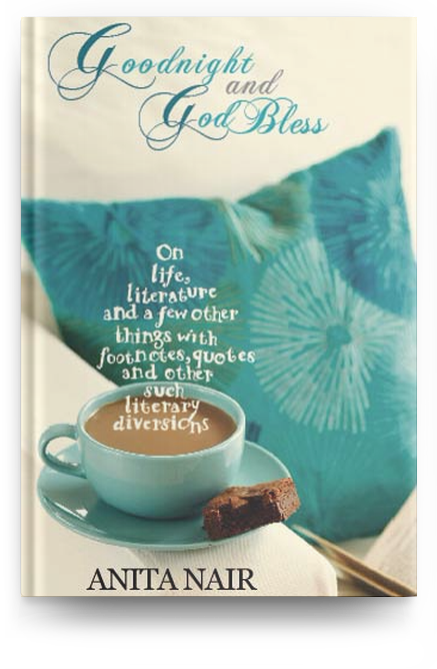 Anita Nair’s Good Night & God Bless is like a personal memoir, with a lavish dose of humour, satire and emotion. It hooks the readers with the author’s daily concerns, from her personal relationships to conversations, to moments of elation. One can take just a chapter at a time, get a hang of the author’s day and leave one’s worries behind, enough to end a day with a smile. Anecdotes as footnotes, sometimes a few famous quotes, Nair makes sure readers don’t feel the need to look elsewhere for more on her world. Whether it’s stories about her daughter, the rest of her family or her dog, it’s through every day conversations, shopping and her writing that Nair tries to give readers a glimpse of her not-so-unusual world.In more than ten years of her writing, Anita Nair’s most popular books have been usually thought provoking, be it The Better Man or The Ladies Coupe, but this time around, the author has a pleasant surprise with a breeze-through kind of novel, the one where she aptly wishes you Good Night & God Bless. A charming feature of the book is the little casual sketches that suddenly pop up at the reader. …Sketches of a dog, a snail, a table and chair, add to the sense of comfort. Readers in the habit of getting a glass of warm milk before bedtime could easily replace their milky drink with Goodnight and God Bless. It’s a collection of essays presented as chapters in a book by and about the author. She’ll tell you about the many flavours of her happiness… You’ll get tips on which books to read, how to differentiate between gourmets and gourmands, how to enjoy being a celebrity-author… There are voluminous footnotes, a recommended reading list at the end and even a couple of tiny shocks to remind us that life isn’t all fresh laundry and double beds…. Informed by a gentle literary sensibility, Nair’s Goodnight and God Bless (elegantly produced in hardback by Penguin-Viking) is a collection of 42 short, personal essays that, whether talking about gardening, travel, strange hotel rooms, parenting, food, literary friendships, or pets, evokes a book-haunted life…. This is the writer as reader. She can’t speak or judge any longer from a reader’s innocence. Yet the desire persists. To simply, as Salinger once asked of us, “to read and run.” Nair’s new book of non-fiction carries with it the added pleasure of “footnotes, quotes and other such literary diversions”. The 42 essays of her life and times have been interwoven with personal and anecdotal history of hers and her family members. Tucked away in the witty lines is the writer’s mind and her ironic take on things small and big. With ‘Good Night and God Bless’, her life and literature have definitely reached an interesting dimension.